The BStU archives in the Berlin central office and twelve regional offices are responsible for the safekeeping, utilization and accessibility of all records of the Ministry for State Security (1950 - 1990). 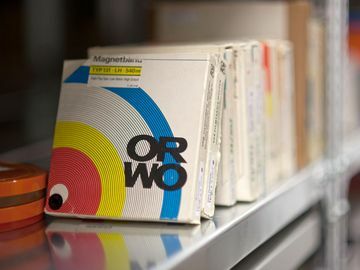 The archives also contain records from various precursor organisations such as the K 5 political police and from the ministry’s successor organisation, the Office of GDR National Security. 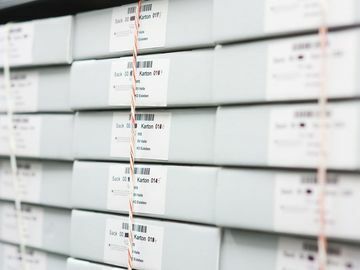 In addition to written documents, the archive also contains a large amount of stored audio-visual material such as photos, slides, film and sound recordings. The documents consist of existing files that the State Security Service had archived earlier as well as material that the MfS was using in its service units just prior to the Peaceful Revolution in 1989/90. About half of the entire 111,000 metres of documents is stored in Berlin. One of the main tasks of the archives is to make the records accessible to citizens and to research and media institutions. The BStU makes the results of this archival work available online through a file index (in German only). Since the files are in constant use, the archives also have to address issues of restoration and conservation to ensure that the records continue to be available in the future. Magnetic tape in one of the shelves in the archive. Bundled documents in the Stasi-Records-Archive in Berlin. Modern storage of records in cardboard boxes. The archives of the central office in Berlin-Lichtenberg are located at an authentic historic site. The Ministry for State Security was based in Berlin-Lichtenberg from 1950 to 1990. It first occupied a building that had previously housed the former Lichtenberg finance office and gradually expanded from there. The buildings that used to stand at the site were either torn down or converted into office buildings. New office high rises and archive buildings were built; a church and two streets disappeared. Over time the headquarters of the State Security Service came to occupy an entire sealed-off block. The records being safeguarded by the Commissioner document the tasks and methods of the Ministry for State Security (MfS) in many different ways. The records provide evidence of the activities carried out on behalf of and with the knowledge of the SED by the GDR State Security Service, which operated as a political secret police, secret intelligence service and "organ" for criminal investigations. The documents are divided into two groups: previously existing records that the State Security Service had archived and material that the service units of the MfS were still using in 1989. In late 1989 and early 1990, courageous citizens from every district and county of the GDR occupied the offices of the Ministry for State Security. The secret police was thus deprived of its power base of knowledge and important documents could be spared destruction. The records that the citizens found in the MfS offices were packed together and placed out of reach of the MfS staff. Original finding aids of the MfS were also secured, in particular the MfS central card file indexes of people such as the "F 16" general card file index of individuals, the "F 22" predecessor card file, and the "F 77" card file of aliases. Several service units of the MfS also maintained their own card files. The Stasi records in the archives of the BStU central office and regional offices are accessible and can be viewed by the public. Altogether they hold 111 kilometres of Stasi files. About 60 kilometres of material was found in the offices of the service units in 1989/90. This collection of mostly disorganised documents is the first to be made accessible and, when necessary, arranged into files. To make these records accessible they have to be ordered and indexed according to people and subjects. Since 1998 an IT-supported program has been used to index the records in a databank (Sachaktenerschließung, SAE). …ca. 51 kilometres of documents from archival holdings of the MfS Archival Department XII (32 kilometres of this collection are held in the BStU regional offices). These documents are indexed by person. …ca. 60 kilometres of documents from holdings of the MfS service units. These include 37 kilometres in the BStU regional offices; 90 percent of this archival material has been indexed. Of the 111 kilometres of documents, a total of almost 50 kilometres of material is held in the Berlin archive of BStU’s central office. This includes reports from unofficial collaborators and summaries of wiretapped conversations. These records include ca. 12 kilometres of MfS file cards. The file cards came from ca. 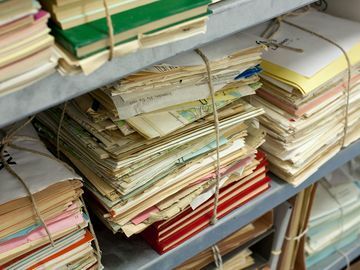 5,700 separate file card indexes that were found in the different Stasi service units. Ca. 23 million file cards are archived in the BStU regional offices and 18 million in the central office. Furthermore, about 15,500 paper bags, boxes, cartons and crates exist that contain torn-up and shredded documents (ca. 8,700 in the regional offices). By now about 1.6 million pages or file cards have been reconstructed. The records that have been retrieved in this way have been indexed in the archive and made available. A pilot program to virtually reconstructed torn-up documents is currently being tested. ca. 2,866 films and videos. This complete collection of material is indexed and accessible. and 54 MfS data projects. Documents concerning the observation and processing of all areas of public and private life, mostly in the GDR and the Federal Republic of Germany, for example, the MfS file categories "Operative Vorgänge," (operative procedures) "Operative Personenkontrollen," (operative identity checks" and "Untersuchungsvorgänge" (investigative procedures). Information summaries and reports on public opinion that the MfS sent to the party and state leadership. Minutes of meetings held at various leadership levels of the MfS. Use of the GDR State Security Service records is regulated by the Stasi Records Act (StUG). The BStU’s indexed data is made available to interested parties, printed in publications and put on the German website. Evaluating the documents according to archival principles (§ 37 Abs. 1 Nr. 2 StUG) is one of the legally-mandated tasks of the BStU. "Evaluation" in archive terminology means deciding whether or not the content of the documents warrants permanent storage. When a document is found to be unworthy, it can be disposed of and scrapped. The BStU archivists’ authority of evaluation, however, is highly restricted. The files of people affected (victim files) and the files of official and unofficial employees of the State Security Service are always preserved. The BStU sees no reason for this policy to change in the future. Strong limitations have been set upon the BStU’s scope of action. The evaluation is based on an evaluation catalogue that has been in effect since 2001. It establishes which types of records are to be evaluated and whether they may be scrapped without replacement. This applies only to records that fall into one of the document categories of the evaluation catalogue, records that have been evaluated on the basis of professional archival criteria and deemed not worthy of permanent storage. A large number of the documents that were disposed of at the BStU were duplicates. Duplicates refer to identical copies of records that the BStU had already archived. A large amount of packing material and empty forms of which the agency had sufficient copies has also been disposed of. Until now only a small amount of records has required content evaluation in accordance with the evaluation catalogue. The State Security Service collections are divided into the partial holdings of the service units and the archival holdings. The records of service units refer to documents that were still being used in 1989/90 and which were found in the offices of Stasi officials. Since this material was very current, greater efforts were made by the Stasi to have them destroyed in 1989/90 and consequently they fell into disarray when they were secured. Other important files are located in the "Allgemeinen Sachablage" or General Subject File (Archival Holdings 2). This partial holding contains a large number of files that cannot be assigned to a specific person, as well as internal MfS administration files. The "Personalaktenablage," Personal Files (Archivbestand 3), includes documents about the official employees of the State Security Service. Archival Holdings 4 contains files from the offices of the public prosecutors and military prosecutors. The MfS archived the Secret Files --highly classified documents -- in Archival Holdings 5. Archival Holding 6 contains files from the Intelligence Administration of the Ministry of National Defence. Archival Holdings 7 contains computerised documents. This archive was later closed down by the State Security Service. Files on military desertion are held in Archival Holdings 8. Archival Holdings 9 contains files from Office I of the criminal investigation police. There are also files from the SED district leadership, which was responsible for party work within the MfS. Topographical maps of various service units were also archived. A few files exist about SV Dynamo, the sports association of the GDR security organs. The finding aids consist of indexes taken from the MfS and finding aids created by the BStU archivists. The MfS indexes are not accessible to external users. These include the Real Name Index F 16, the Procedures Index F 22 and the Aliases Index F 77. They are, however, very important for research and always included in research on individuals. The finding aids created by the BStU archivists are available online (in German only) and can also be viewed in the Reading Room. © Copyright by BStU. All rights reserved.